Springtime: Time to prepare the nest /Hawks Aloft Inc.
Our 23 year old Swainson's Hawk prepares a nest for foster young © Gail Garber. At 23 years young, she is far and away the best foster parent of all of our educational birds. In fact, she lives for babies! Initially, we thought she was a male bird. That is, until she laid her first egg. She’s been a stalwart, proven education bird, among the easiest to handle, even for newbie volunteers. She can be counted on to sit on her travel box at an outreach booth for the entire day, snoozing throughout much of it. In short, her pleasant personality makes her a favorite with the staff and also with the volunteers. However, it seems that, in her mind at least, educating the public is just part of her job, boredom personified, as she sits all day long while an adoring public watches. Each winter, usually around the holidays, she begins checking out the remnants of her previous year’s nest, moving the ever-present sticks (that we provide) around, skulking in the corner near the nest, and laying in it. 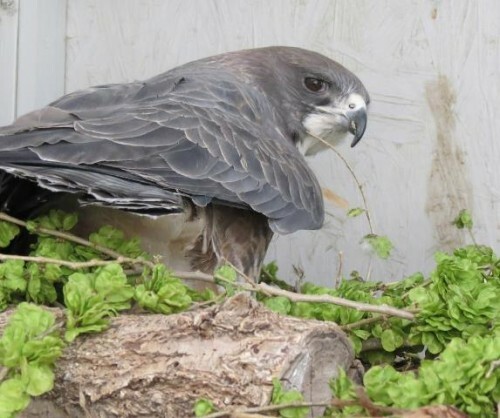 We always hold out until mid-March before providing nesting materials in earnest because we know that, once the cycle starts, she won’t have to appear again in public until July, at the earliest. And so it goes! She is hard at work on her 2012 nest now, carefully arranging the green branches that Gail provides daily. Before April’s end, she will have laid 2-3 whitish eggs, which she will incubate, apparently endlessly. Without a mate, her eggs are infertile (in case you are wondering, she has rebuffed any and all companions in her expansive mews – except for babies). Thus, she is dependent on the arrival of an orphan to fulfill her biological cycle of motherhood. So far, she’s reared orphaned Red-tailed Hawks, Harris’ Hawks, and Swainson’s Hawks, that sometimes arrive when they are only a few days old. It is an important job, and one that she takes very seriously. 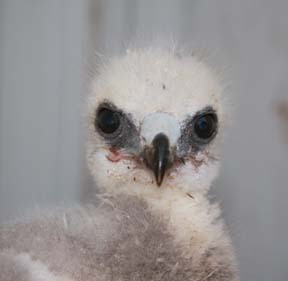 The babies often are delivered by Wildlife Rescue or the Wildlife Center. While we don’t wish ill on any of the nests of wild birds, it is a very sad year indeed, when no orphans arrive in need of a mom! It is her mission. She is so dedicated that once the chicks near fledging age, they must be taken to a rehab center to attend “mouse school” and practice flight skills in a huge flight. We once tried to put live mice into her cage so the young could acquire predation practice. Instead, she ran around and quickly killed everything in there, making sure there were no threats to that year’s young. To the right is one of the chicks she reared in 2010. No babies arrived in 2011. We will keep you posted if any new babies arrive in 2012.